Hellboy’s creator takes on history’s greatest monster! This March, Mike Mignola will be taking on one of the most notable characters in literary history in an upcoming comic series. 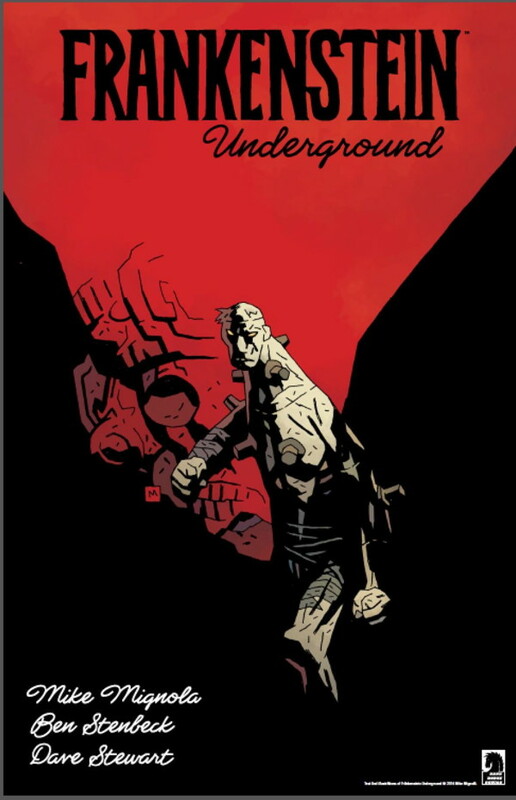 Frankenstein Underground will be a 5-issue miniseries, with issue #1 releasing March 18th, 2015. In a recent Dark Horse Comics press release, “the miniseries follows the Frankenstein monster, who is alone, abandoned, and wandering underground, where he discovers both other monsters and the dark secrets to the universe”. This will be the second appearance of Frankenstein within the Hellboy, B.P.R.D., and other Mignola titles after first appearing in House of the Living Dead graphic novel. First created by English novelist, Mary Shelley, it will be great to see this character flourish in a comic series by a talented writer. Scott Allie, Dark Horse Comics’ editor-in-chief assures that “this version of the Frankenstein monster has the same thirst for knowledge readers will remember from Mary Shelley’s novel” and went on to say that this miniseries will take readers through some of the biggest mysteries of the Mignolaverse. The series will be written and have covers drawn by Mike Mignola, with interior artwork by Ben Stenbeck,a and coloring by Dave Stewart.